Missionaries endured staggering hardship in those rain forests. Sometimes they could not fly and, in order to reach isolated groups, had to travel over land by foot. They hazarded unpredictable rivers by canoe to reach poorly mapped territories where fear-ridden tribal peoples lived. Knowing what we know, our surprise is not that so many died, but that so many other missionaries have survived. In 1944, five missionaries working with New Tribes Missions in Bolivia were killed trying to reach the fierce Ayores. The five were probably murdered weeks before the search party even left to look for them. Their bodies were never found, and the entire event received little notice by the world press. After all, this news item was buried beneath the happenings of World War II. Today, if someone mentions the five intrepid missionary martyrs to the jungles of South America, few recall the names of Cecil and Bob Dye, Dave Bacon, George Hosbach or Eldon Hunter. Naturally speaking, we see several reasons why the deaths of Jim Elliot, Peter Fleming, Ed McCully, Nate Saint, and Roger Youderian created such a sensation. There was a lull in world news at that moment. The mystique of the jungle savage excited curiosity. Careful records were available in the journals of the missionaries. The public was informed in a blow-by-blow manner as the facts of the massacre came to light. And here were five striking young men, with intelligent wives and winsome children. These young men looked like fellows we might meet in our own neighborhoods. What were they doing there? Spiritually speaking, we also see reasons why God was pleased to speak so clearly in that event on January 8, Here is a story that inspires us more the more we know of it. The martyrs all were raised with the gospel from youth. Each was considered a role model. Jim Elliot was from Portland, Oregon. At Wheaton College, he was president of the Student Foreign Missions Fellowship. A persuasive communicator, he wrote in college: “O God, save me from a life of barrenness, following a formal pattern of ethics, and give instead that vital contact of soul with Thy divine life that fruit may be produced, and Life-abundant living-may be known again as the final proof for Christ’s message and work.” He married Elisabeth Howard from a prominent Christian publishing family in Philadelphia. At the time of the murder, the Elliots had an infant daughter. Peter Fleming was from Seattle, Washington. At 27, he was a year younger than Jim Elliot. Pete had recently received his M.A. in literature. He was married to his childhood sweetheart, Olive. Ed McCully, from Milwaukee, Wisconsin, was president of his senior class at Wheaton. He won the National Hearst Oratorical Contest in San Francisco in 1949 and went on to Marquette University Law School. He and his wife, Marilou, had two sons and were expecting a third. 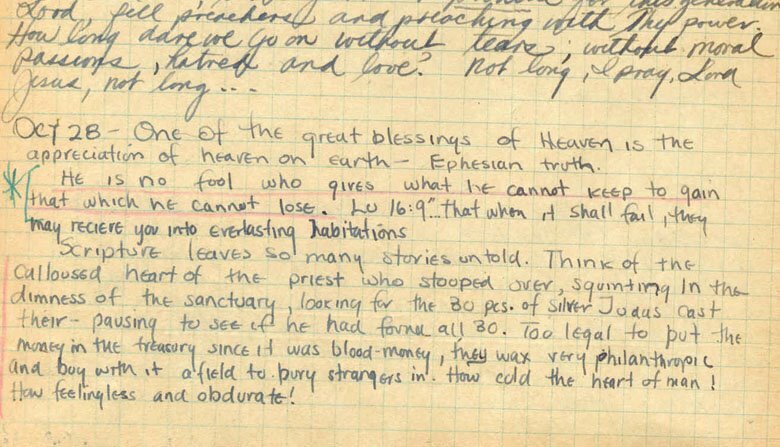 “I have one desire now-to live a life of reckless abandon for the Lord, putting all my energy and strength into it,” Ed wrote in a letter to Jim Elliot immediately after leaving law school on September 22,1950 (Splendor, pp. 5051). Roger Youderian came off a Montana ranch. An airborn ranger who was at the battle of the Bulge, he later went to Northwestern Schools in Minneapolis, where he met his wife, Barbara. They joined the Gospel Missionary Union and were evangelizing the headhunting Jivaros when the Elliots, Flemings, and McCullys arrived. Nate Saint had flown missionaries in and out of the Ecuadorean jungle since 1948 for Missionary Aviation Fellowship. Builder, inventor, and skilled pilot, Nate had devised a ingeniously simple back up fuel system for single-engine planes. Nate was married to a nurse, Marj, whom he had met in the service. They had three children. The five couples did not come to Ecuador planning on reaching the Waorani tribe. But in Ecuador they heard about these Indians referred to as “Aucas” meaning savages. They had never been subjugated by soldiers or won over by missionaries. Victors, we rest with Thee through endless days. On Friday, they had a visit from three Waorani. On Sunday, Nate flew his plane over the area and spied a group of men walking toward the beach. He radioed Marj. “A commission of ten is coming. Pray for us. This is the day!” The next communication was scheduled for 4:30 PM. It would never come. As newspaper headlines read, Five Missionaries Missing in Ecuador, a rescue party was moving overland. Missionary pilot Johnny Keenan flew over Palm Beach and saw a body; on a second pass, he spied a second one in the river. By Thursday, two US Navy fliers went in with a helicopter. They found four bodies in the river, speared and hacked by machetes. Jim, Nate, Peter, and Roger were identified. It was speculated that the first body seen from the air was Ed McCully’s and that it had been carried away in the river’s current. The January 23 Newsweek magazine ran the news. But it was Life photographer Cornell Capa who was at Palm Beach via helicopter when the last body was being lowered into the grave. His sensitive photography and the account of the drama published in Life made this the missionary story of the century. Readers Digest also published the story in 1956. Some church leaders responded to the massacre as did Judas when the costly perfume was poured on the Lord Jesus, saying, “Why this waste.” To such we can only say that God’s ways are not our ways (Isaiah 55:8-9). The foolishness of God is wiser than men (1 Corinthians 1:25). In following months, mission boards were deluged with offers to “take the place” of the martyrs. Eternity magazine counted six hundred missionaries who credit the martyrdom as influencing them to go overseas. In the fall of 1958 Rachel Saint and Betty Elliot and her toddler, Valerie, hung their hammocks among the Waorani. While Valerie played with the children of her father’s murderers, Rachel and Betty became acquainted with the murderers themselves: Gikita, Kimo, Nimonga, Dyuwi, Minkayi, and Tona. Surely the enduring attraction to this story is as much about the lives of the martyr’s survivors, as it is about the five men that gave their lives. We not only know the five men by their journals and aging photos. We know them by the lives of the missionary widows, their children, the lives of the Waorani converts and the missionaries that continue to serve them. This is more than a memory. By their fruits we know Ed, Jim, Nate, Pete, and Roger.